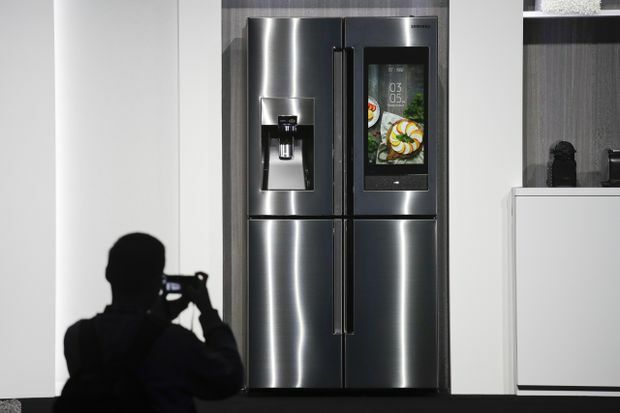 An attendee takes photos of the new Samsung Family Hub smart refrigerator during a news conference at CES International in Las Vegas on Jan. 8, 2018. Optimistic self-improvement is a boom market, especially at this time of year, with apps such as Habitshare, Habitica, Done and Productive, which are designed to help users form better life habits, topping download lists. The concept of a smart home offers a similar promise of domestic utopia, the untold potentials of efficiency and convenience through transformative technology and home connectivity to simplify tasks and thereby enrich daily life. This is also the underlying sell of the annual Consumer Electronics Show in Las Vegas, an extravaganza of 4,000 companies exhibiting and revealing their latest gadgetry. Originally a showcase of in-home consumer electronics – think Coachella, but instead of musicians, it’s television sets that are headliners – this year sees the requisite debut of bigger and better 8K TV sets and 5G smartphones. But the lineup is also rife with presentations on the potential of driverless cars, the impact of sleep-related tech and indoor air quality sensors on productivity, along with panels brainstorming ways to increase smart home adoption, which has lagged compared to industry projections. I’m glad the smart-home revolution has been delayed, but I worry that it’s coming. Consumer companies have been trying to make the smart home happen since the 1950s. The “Design for Dreaming” promotional video for General Motors’ 1956 Frigidaire concept kitchen, for example, sold push-button homemaking that enabled a newlywed housewife to do better things with her time. The kitchen included rotating storage for dry, refrigerated and frozen foods, self-rinsing cabinets and an electronic recipe file. Around the same time, in the late 1950s, RCA and Whirlpool’s sleek “Miracle Kitchen of the Future” model toured around the world. Here, the housewife worked a control panel with a transmitter that acted as the “heart and brain” of the home and was eventually exhibited at the American National Exhibition in Moscow. It was a fitting location to wind up in because what’s planned for the future is basically a Soviet dystopia of all-seeing, all-hearing appliances. The essential difference between then and now is that, unlike today, 1950s household gadgets weren’t a pretext for data-gathering mechanisms. In November, Amazon opened a smart home pop-up at Toronto’s Eaton Centre, its first foray into physical retail in Canada. The three living spaces had turquoise honeycomb branding and were designed with the same sleek anodyne finishes of a typical condo model suite. And virtual assistant Alexa was integrated throughout, as were compatible products from partners such as the Ecobee thermostat, responsive light effects from Philips Hue, iRobot Roomba and Sonos soundbar. On request through its app, the Samsung Family Hub smart fridge shares a photo of what’s inside. As though having to pry open the fridge door and jot down a few supermarket necessities were a grievous imposition. Computing is already woven into everyday lives and consumer product companies would have us let more sensors, cameras and microphones into the domestic ecosystem. First, with the Nest and other smart thermostats, it was the promise of virtue by automating energy use and saving money; next came the peace of mind of integrated security with smart camera doorbells. These devices are expected to become more popular in the coming years: Intel anticipates that the number of connected devices in a typical home will grow from the present 10 to more than 35 by 2020, which is also the year leading tech manufacturers promise full Internet of Things-ready intelligent products and next-gen virtual assistants. Putting aside the domestic espionage possible with these devices – eavesdropping on kids play dates, checking the fridge for what teens hanging out in the basement after school may have put in it, Fresh-r sensors that notice the increase in CO2 levels in case those teens are having a party when you’re not home – it’s the corporate surveillance they enable and a fundamental illusion about who’s in control that is worrisome. That Samsung smart refrigerator? Once you log into the app, it quickly moves from showing you the contents of the fridge to offering shopping suggestions, third-party grocery retailers, schedule-sharing platforms and its own messaging software, all in the guise of a helpful digital hub that will streamline the chaos of a busy family life. As Shoshana Zuboff explains in her chilling and essential new book The Age of Surveillance Capitalism, every pattern, habit and command is harvesting data and the lack of transparency about the end use, or whether it’s being accessed and sold to third parties at all (consent be damned) should be unacceptable. In the 1950s, a prescient observer of so-called modern conveniences, comic genius Jacques Tati made Mon Oncle about the implications of a smart home called Villa Arpel. Inept humans allow the house’s automation to control its inhabitants, even trapping people inside while eroding their human relationships. The cinematic satire was billed as a farce – it won best foreign language film at the Oscars in 1959 – and it’s a hilarious send-up until the reality that the supposedly helpful house was actually outsmarting us all hits home. Live with style. We have a weekly Style newsletter on fashion and design trends, plus shopping tips and inspiration. Sign up today.